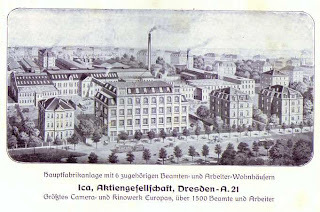 In 1909, the four camera makers Hüttig AG in Dresden, Kamerawerk Dr. Krügener in Frankfurt/M, Wünsche AG in Reick near Dresden and Carl Zeiss Palmos AG in Jena joined forces to become the Internationale Camera A.-G. (ICA) in Dresden. Hüttig, one of the oldest camera makers was founded in 1862. Originally, the company logo was a five-pointed star. Later this was changed to a light-bearing angel. ICA produced a variety of cameras. Of course some camera lines of the founding companies were continued. The plate cameras Sirene 135 and Ideal are common. In 1926, ICA was one of the name-giving partners in Zeiss-Ikon. The others were Ernemann, also in Dresden, Goerz and Contessa-Nettel. Ica Nixe model 595, high quality large rollfilm camera, was the deluxe version of the Lloyd and the Halloh. Here, with Hekla 1:6,8 Foc 15 cm Nº 252335 lens. Ica Ideal model 111, with Rodenstock Trinar ! :4,5 f= 10,5 cm Nº 434393 lens. Zeiss Ikon Ica Maximar 207/1 with Preminar 1:4,5 f=13,5 cm Nº 741699 and Deltalinse 13,5 x 1,6 Nº 4308 Ica Akt.- Ges. Dresden lens.Compur Nº 100699 , D.R.P. Nº 258646 D.R.G.M. ( 1926) transitional Zeiss Ikon merged camera.